Exploding on to the scene in 1994, the adidas Predator revolutionised football boot design – and from here, there was no going back. Representing probably the most significant advance in football boot technology since Adi Dassler pioneered screw-in studs 40 years previously, the ’94 Predator singlehandedly catapulted boot design into the modern era. Its rubber fins, stretching across the forefoot, were designed to provide players with a previously unheard-of degree of control and swerve on the ball, as well as power. Legends of the game Jurgen Klinsmann and Ronald Koeman were among those who wore the boot at that year’s World Cup in the United States, won by Brazil against Italy on penalties after Roberto Baggio skied his decisive penalty in the shoot-out. By 1996, the adidas Predator was well-established as one of the best-known football boots in the game. The adidas Predator Touch arrived that same year, and was worn at Euro ’96 by stars including David Beckham, as England embarked on a brave run to the semi-finals which was to end - perhaps predictably - at the hands of eventual tournament champions Germany. The Predator Touch took the series’ reputation for boldness and innovation further, introducing the Traxion – a rectangular stud which would again change the face of football boot design and, in time, pave the way for the blades so commonplace today. The 1998 adidas Predator Accelerator dropped in time for the World Cup in that year, which saw the boots worn by global megastars including Zinedine Zidane – who bagged a brace in France’s 3-0 final win over Brazil – as well as England’s David Beckham (whose own tournament ended in notoriety with his sending-off against Argentina) and Italy’s Alessandro del Piero. 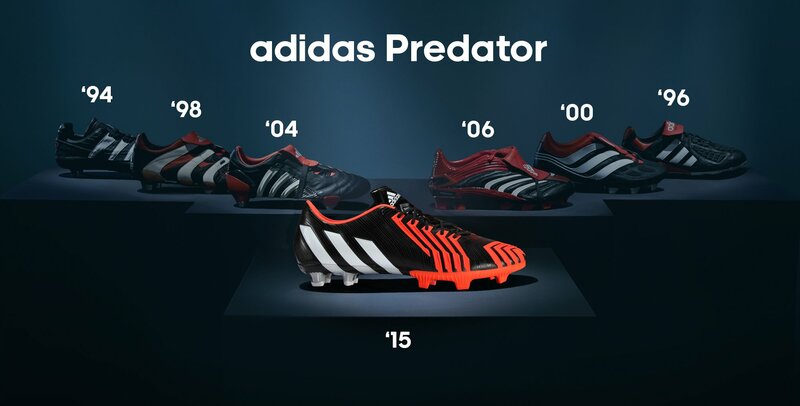 The ’98 Accelerator boot took the Predator’s trademark control, swerve and power to the next level by lowering the fins and reshaping the boot for a more natural fit. Introduced ahead of Euro 2000 in the Netherlands and Belgium, the adidas Predator Precision was the boot worn by the likes of David Beckham, Patrick Kluivert, Kaka and Steven Gerrard that year. Among the notable new features the Precision boasted was its fold-down tongue, with Velcro on the underside to keep it in place – thereby expanding the striking area and enabling an even greater degree of control on the ball. The rubber fins were also evolved further, this time incorporated as a number of small patches around the toe area of the boot. The adidas Predator Pulse made its debut in the run-up to Euro 2004 in Portugal, which would end in an entirely unexpected underdog triumph by a resolute and well-organised Greece side. Worn again by stars including Zidane and Beckham, the adidas Predator Pulse incorporated PowerPulse technology designed to shift the boot’s centre of gravity closer to the zone of impact – thereby allowing for enhanced striking power. In a collection of boots renowned for their savage power, this took it even further and again represented a major advance for the Predator. Featuring a new, radical look and a lightweight design for enhanced accuracy, the adidas Predator Absolute made its debut in 2006 – and promptly took that year’s World Cup by storm, worn by big names including Patrick Vieira, Kaka and Raul as well as Beckham and Zidane. The Absolute’s innovative design incorporated the use of liquid rubber to create the ‘Power Zone’. The aim was to offer more effective cohesion and hence prolonged ball contact, allowing players to place passes and shots more effectively in addition to enabling more effective dribbling with the ball. Arguably the most iconic football boot of all time, the adidas Predator dates back to 1994 when an idea was brought to life by former player Craig Johnston. The very first boot would see a revolutionary design placing rubber strips over the forefoot with the aim of improving control, swerve and power, this coupled with the three white stripes and the red details, would see the birth of a legend. Over the years the adidas Predator has been at the forefront of some iconic games and goals, starting with John Collins opener against Rangers to Gerrard’s 2006 Fa Cup Final wonder goal. As the years passed the success of the boot was obvious, Zinedine Zidane propelled France to the 1998 World Cup with 2 goals in the Final. Many players would enjoy lasting careers in partnership with the Predator range, David Beckham, idolised by millions, had kids across the planet emulating his style and trying to ‘Bend It Like Beckham’. In 2002 Beckham wore the Predator Mania editions, arguably the most popular of the series. This boot wouldn’t be seen again, until now. adidas will be bringing back to life this iconic must have, can the next generation of players achieve the same success as the predecessors.